What a blessing it is to be having a real winter! Normal amounts of snow that will hopefully keep the fire danger down this summer and will provide plenty of irrigation water for hay crops. And what interesting timing. With my husband gone, I’m now solely responsible for snowplowing and filling stock tanks and moving hay bales and all the other chores of the farm in winter (and I’m grateful for all the help I’ve been offered, too). It didn’t take me long, though, to know that there aren’t enough hours in the day. It’s normal when practicing progressive breeding to have ebbs and flows in the size of a breeding herd. As one works to produce better ponies with each generation, it’s common to retain daughters. Then a need for a second stallion emerges, and the population grows. Then when those daughters begin to produce offspring, it becomes time to select which females to retain and which to rehome to keep the herd size realistic. I knew I was reaching the point where I was going to have to make some difficult decisions this year. With my husband’s passing, though, I began to see opportunities to reduce my pony population that I might not have seen otherwise. For instance, I had kept my Fell Pony mare Restar Mountain Shelley III open (unbred). While I wasn’t interested in selling her, an idea occurred to me. My friend Tina has a two year old Fell that she hopes to eventually use for riding and driving. I thought Tina might find it appealing to have a full grown mare to ride until the filly is ready to go to work. While the idea made sense logically, I wasn’t fully prepared for how much I would miss Shelley. Fortunately, letting her go temporarily is already producing gifts. Tina asked for some video of me working with her, so she would better know what Shelley responds to. My heart was warmed when Tina observed how much Shelley enjoys being with me. The feeling is definitely mutual! Then I got the pictures here of Shelley encountering new beings in her life with quiet acceptance and curiosity. That’s my girl! Having Shelley go visiting has definitely freed up some time each day. Her departure is the first of several. My goal is to get from five paddocks of ponies down to two while I adjust to life without my husband. It won’t surprise me at all if I’m back up to five paddocks again a few years out! There is still a void here that Shelley used to occupy. It is hard to see her stall empty, her tracks still in the snow, her voice not greeting me at feeding time. But I take great solace from knowing Shelley will be coming back to me before long, and in the meantime Tina will have lots of stories to tell me about my girl. When I produced my first filly in my breeding program, I decided to keep her to use as a broodmare. I assumed, therefore, that the breeding life of a stallion in my herd would be a single generation. When the first crop of his daughters were old enough to breed, I’d move that stallion on and bring in another that was unrelated to the daughters of the first. Managing one stallion is hard enough, and two is a definite workload. In addition that strategy is what I’d watched a number of breeders in Cumbria do, so it seemed like a reasonable strategy. A problem with this strategy has arisen, though. I was talking to a gentleman who trains his sled dogs here in the winter. When we talk, we inevitably get onto the subject of breeding. In this case, he pointed to one of the dogs in his team, an intact male, and he said, “That dog is the sire of all my best racers.” He then pointed to another dog and said, “That dog is the mother of most of my best dogs. I spayed her so I’d quit breeding.” John says he wants to retire, but I’ll believe it when I see it. John then went on to say, “That male dog is prepotent. You know Secretariat wasn’t. He couldn’t breed anything as good as he was.” John went on to tell me another horse-related story and then it was time for him to attend to his dogs. What he said, though, crystallized a thought in my mind. Prepotency is the ability of one parent to impress its hereditary characteristics on its progeny. One of the best known examples in the horse world of prepotency is Justin Morgan, the sole founding sire of the Morgan horse breed. His ability to repeatedly and reliably stamp his offspring with his own desirable characteristics is the reason given for the breed’s existence. In the Fell Pony, we don’t have a dominant ancestor stallion like Justin Morgan, but I do occasionally see stallions that leave their mark. One that comes to mind has a number of daughters that I greatly admire. Another seems to be leaving consistently good offspring of both genders. In the case of the first stallion, I’ve wondered if the reason so many of his daughters are good is that good mares were put to him, or said another way, the breeder who controlled his breeding calendar had a very good eye for what the stallion would cross well with. In the case of the second stallion, he’s linebred, and I’ve wondered if that is the reason that his offspring are so consistently good. Both of these stallions might be considered prepotent, having the ability to impress their favorable characteristics on their offspring. When I’ve heard stallion prepotency discussed, I’ve never heard if line-breeding or careful mare selection were in play, but from what I'm seeing, they certainly could play a role. Each day when I enter my mare paddock, I encountered three daughters by my senior stallion, and I love the type of all of them. And when I enter the paddock where my senior stallion lives, I love his type, his personality, his movement, his easy-keeping qualities. Under my original breeding program strategy, because I have three daughters, this stallion should now be considered obsolete. But the problem is I can’t part with him; I like him too much. After talking to John about prepotency and especially when he mentioned that a great stallion like Secretariat couldn’t throw anything as good as he was, I reached a tipping point. My stallion is throwing stock as good as he is. As I’ve pondered this, I’ve realized he is both line-bred, and the mares he breeds are carefully selected. He is therefore like both those other Fell Pony stallions whose stock I admire. In addition, another breeder whom I admire has bought my stallion’s close relation for breeding, another affirmation of the line. I have no idea how long the breeding life of a stallion is in my climate. I know more than one stallion that has produced stock past the age of twenty, so in theory I have several more years left. So I’ve decided to find another mare to put my senior stallion to. Sometimes the best laid plans have to be modified! I’ll be keeping two stallions after all! It has been my experience in breeding Fell Ponies for the last fifteen years that stallions have a significant influence on the temperament of their foals. And since traits can skip generations, I’ve also seen an influence in the second generation. Having noticed this pattern regarding temperament, I have made breeding decisions towards or away from certain stallions. After a conversation with another breeder on the topic, though, I saw a pattern in some of my foals that pointed to the mare side of the breeding equation instead when it came to temperament. It was after a third foal was born that exhibited disinterested behavior at a young age that I spoke to the breeder on the topic of mares and temperament. This breeder was seeing a pattern of temperament inheritance on the dam side, and sometimes the particular behaviors were even seen in the grandchildren. Suddenly a lightbulb went off in my brain, and I saw a pattern in my disinterested foals. To request the complete article on Mares and Temperament, click here. 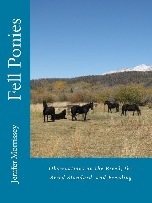 The book Fell Ponies: Observations on the Breed, the Breed Standard, and Breeding contains many stories like this one. It is available internationally by clicking here or on the book cover.